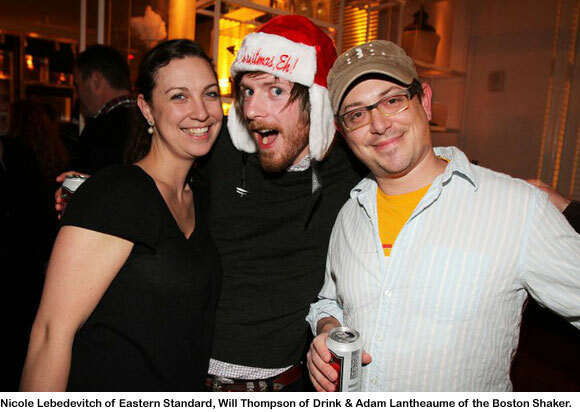 Arguably Boston’s three best bartenders — Jackson Cannon of Eastern Standard and John Gertsen and Misty Kalkofen of Drink — competed against each other and Miami’s finest, John Lermayer, in a showdown that capped a series of drink-mixing battles between Boston bartenders (and sometimes their colleagues from other cities). And there to cheer the competitors on was seemingly every other bartender of note who wasn’t on the stick that night. Thankfully, no bombs were dropped. Except for this one: the guy from Miami won. That’s right, John Lermayer, who tends bar at the Florida Room and consults for hotel bars around the world, bested his Beantown colleagues fair and square. I should know, because I was one of the judges. His winning cocktail, the Misty Morning Sour (see below), hit all the criteria admirably: quality, creativity, presentation and use of surprise ingredients — persimmon and Barenjager honey liqueur. Misty Kalkofen took second place for her mezcal-based Per Simon. In the quality department, all the cocktails got high marks on my ledger — particularly considering they were each created in an astonishing 20 minutes. 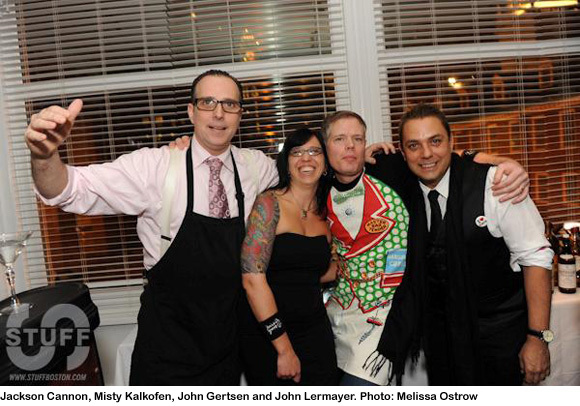 Here are some pics from the bash, plus the recipes that each of the four competitors came up with. What a pleasure it was to literally drink in their talents. Muddle persimmon and strawberry in a mixing glass. Add remaining ingredients and dry-shake. Shake all again well over ice. Strain into cocktail glass with sliced strawberry and persimmon garnish. The name: inspired by how John imagined his fellow contestant, Misty, would feel the next morning. Muddle persimmon in a mixing glass. Add all other ingredients except nutmeg and shake well over ice. Strain into a cocktail glass and garnish with fresh grated nutmeg. The name: a play on one of the surprise ingredients and on the name of one of the judges, Simon Ford, international ambassador for Plymouth gin. Dry-shake first four ingredients and strain through a tea strainer. Dry-shake strained ingredients with egg white. Shake all again with ice. Strain into a champagne flute, top with Peychaud’s and sparkling wine. The name: inspired by the blue moon in the sky that evening. Muddle pepper in mixing glass. Add all ingredients except twist. Add ice, shake and double strain into a chilled coupe. 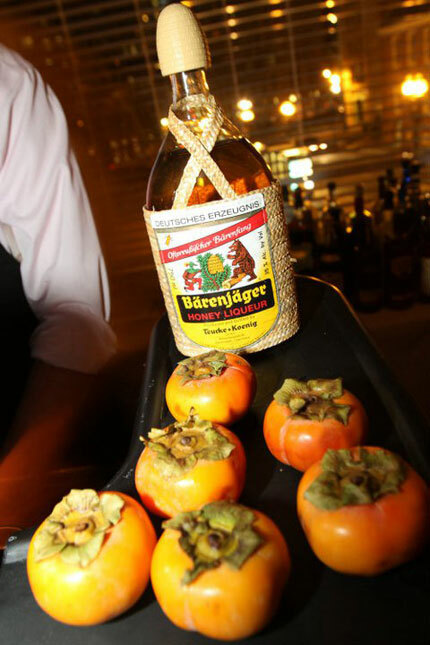 Garnish with the twist. The name: a play on Drink’s peppery Bee Sting, which is itself a play on the classic Bee’s Knees. *The Plymouth Gin was infused using a quick infusion technique known as nitrogen cavitation. Gertsen used a 1 liter iSi profi whip canister, added 375 ml of Plymouth Gin and the pulp from 4 medium-sized persimmons, and charged the canister twice with nitrogen. Except for top photo, all photos by Mark Andrew Deley of Crammed Media. 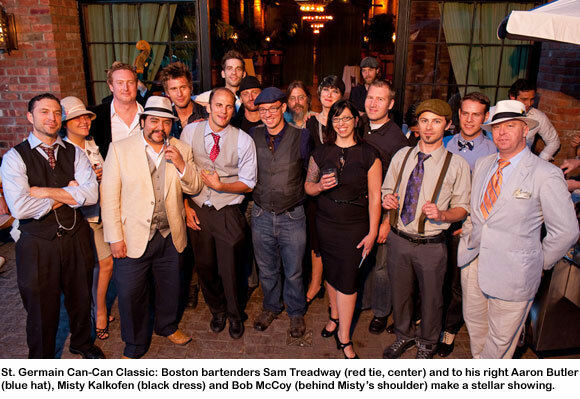 Four Boston bartenders competed in yesterday’s third annual St. Germain Can-Can Classic at the Bowery Hotel in New York City, and two of them took home the top two prizes. Congrats to Bob McCoy of Eastern Standard for his 1st place, $5K win and to Misty Kalkofen of Drink for her 2nd place, $2K win. 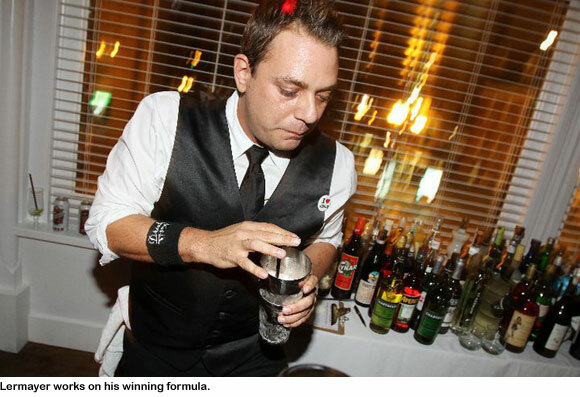 Three cheers as well to competitors Aaron Butler of Russell House Tavern and Sam Treadway of Drink for rounding out Boston’s prowess in this mixology event. 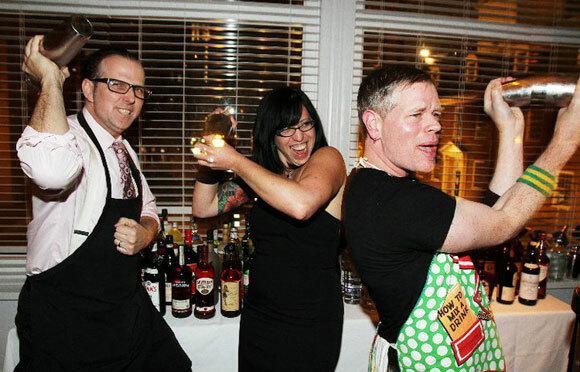 Each of the four bartenders became eligible to compete in the Can-Can by winning St. Germain’s monthly cocktail contests. McCoy, who also employed the elderflower liqueur to great effect at drinkboston’s Bartenders on the Rise event, impressed this year’s Can-Can judges with the mixture below. More recipes and tidbits to come as I get them. Combine all ingredients in a mixing glass, add ice and stir. Strain into a coupe glass and garnish with a lemon twist. Shake vigorously with ice and strain into a champagne saucer or cocktail glass. Shake (and shake and shake) and strain into a chilled cocktail glass. Garnish with grated nutmeg. Stir all ingredients well over ice and serve straight up in a heavy-bottomed rocks glass.